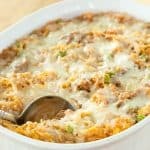 A healthy, gluten free, low carb comfort food that's just as creamy, cheesy, and delicious as any pasta casserole recipe. Baked Spaghetti Squash with Spicy Sausage Tomato Cream Sauce is healthier and veggie-packed comfort food. 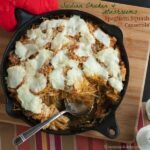 This creamy and cheesy spaghetti squash casserole is an easy dinner recipe that’s also low carb and gluten free. 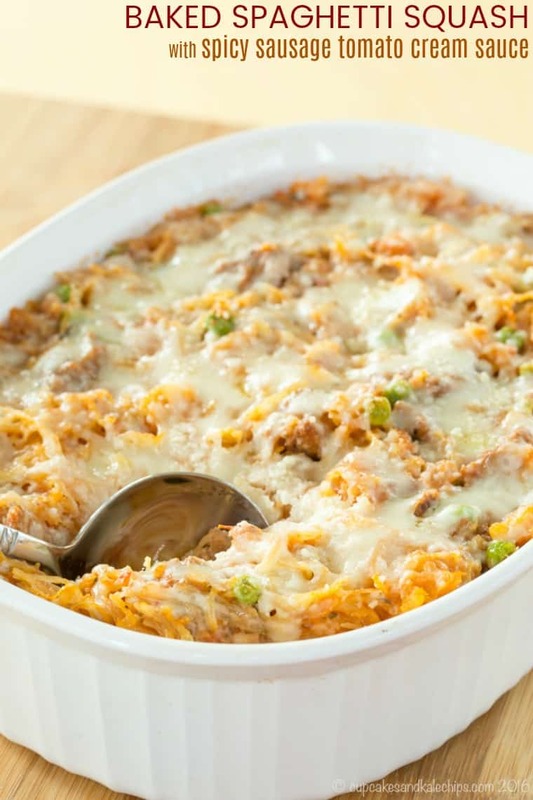 It’s a great gluten free casserole recipe any night of the week! I’ve gotten a few people intrigued by spaghetti squash, and some who haven’t had it in awhile are looking for new ways to use it. Sometimes I am happy to just eat it with basic tomato sauce, Vegan Vegetable Tomato Sauce with Chickpeas, or even Classic Vodka Sauce. And the other day, when I was craving fall flavors, I poured over Pumpkin Cauliflower Alfredo. But other times I want a change from just topping it with a sauce. 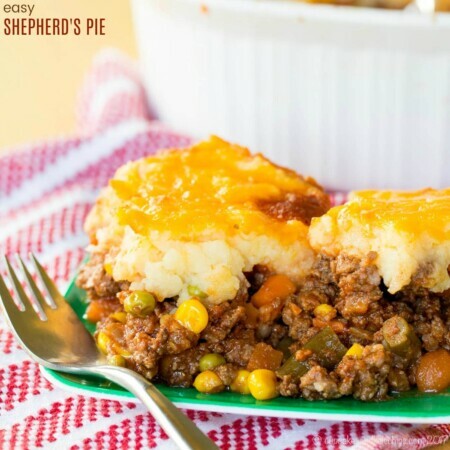 This recipe has been a favorite of several friends over the years, plus my family as well. Although I must say, I do have a love-hate relationship with spaghetti squash. Yes, it’s a great pasta alternative for people like me who have to avoid gluten, or those that have to watch their carb intake. Plus it’s delicious. I’d actually take spaghetti squash over noodles any day. But seriously, I’m afraid I’m going to lose a finger every time I try to hack into one. Yes, I know you can bake it without cutting it in half, but I find that it retains a little too much moisture, especially when you are putting it into a spaghetti squash casserole like this recipe. And extricating the seeds and the fine stringy things from the squash “noodles” is definitely harder than just scraping them out of a raw spaghetti squash. Baked Spaghetti Squash with Spicy Sausage Tomato Cream Sauce is a healthy, low carb, gluten free dinner even the biggest pasta-lovers will enjoy! Cook your spaghetti squash (I’ll tell you more about how to do that below) and scrape out the “noodles” with a fork. Brown the sausage in a pan, then add onion and cook till soft and translucent. I like to use turkey sausage, but traditional hot pork sausage will work. I suppose you could even use ground beef and then add a little red pepper flakes for that kick. Next you’ll add wine, a can of crushed tomatoes, and some seasonings. Let it simmer a bit before stirring in heavy cream, parmesan cheese, and frozen peas. You’ll then pour the sauce over your spaghetti squash. If there’s too much, just save the extra to pour over later or to use for something else. Transfer the saucy squash noodles to a baking dish, top with mozzarella cheese and parmesan cheese, then bake until hot, melty, and golden. 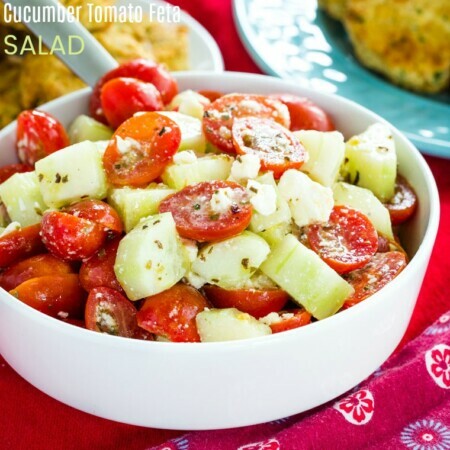 You really don’t need anything else, but you can serve it with a simple side salad with Greek Yogurt Creamy Balsamic Vinaigrette or an Italian Style Wedge Salad. Maybe you haven’t tried spaghetti squash yet. 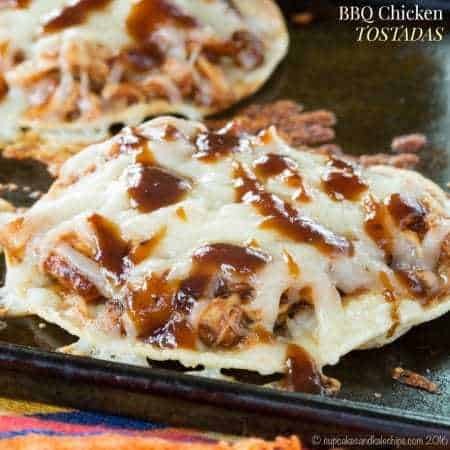 This is a great recipe to make to start out because it is super easy and absolutely delicious. But if you aren’t quite ready to make the spaghetti squash leap, at least try the sauce over some spaghetti or penne or whatever pasta shape you prefer. With the little bit of kick from the spicy sausage smoothed out by the bit of cream that makes the sauce rich and velvety, you are going to want to pour it over everything. I added few peas for a pop of texture and color, and of course we all know that no pasta (or fake pasta) casserole is complete without some cheese on top. You guys, I know this is the most cliche and overused word to describe a dish, but seriously, it is really yummy! I hope you’ll try it soon! In order to make this recipe, you need the “noodles” from a cooked spaghetti squash, so here are some tips. Cut it in half lengthwise with a large knife. Scrape out the seeds and the fine strings. A large soup spoon is helpful for this. Place both halves cut side down on a cookie sheet that has been sprayed with olive oil or cooking spray. Put the baking pan into the preheated oven. Bake for 30-45 minutes (depending on the size of your squash, maybe a bit longer if you have a really big one), or until the outside is slight browned, and the flesh is soft enough to be scraped out easily with a fork. I usually start poke it with a fork around 30 minutes, and then keep an eye on it if it isn’t ready. Scrape out the spaghetti squash strands with a fork (or two). You can also check out how to cook spaghetti squash in rings which requires more cutting but cooks faster. For a quick and easy option, you can microwave spaghetti squash. If you want to let it cook all day in your slow cooker, just pierce it with a knife and cook on low for 6-8 hours or high for 3-4 hours. And if you have an Instant Pot, Pressure Cooker Spaghetti Squash is quick and easy. What else can you make with spaghetti squash? And how about 12 of the Best Spaghetti Squash Recipes! 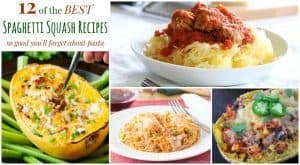 My friends also have some other amazing spaghetti squash recipes. Turn your favorite dip into dinner with Spinach Artichoke Spaghetti Squash from Taste and Tell. Proving simplest is best is this Cacio e Pepe Spaghetti Squash from A Family Feast. And a classic gets lightened up with Chicken Cacciatore Stuffed Spaghetti Squash from Sugar Free Mom. 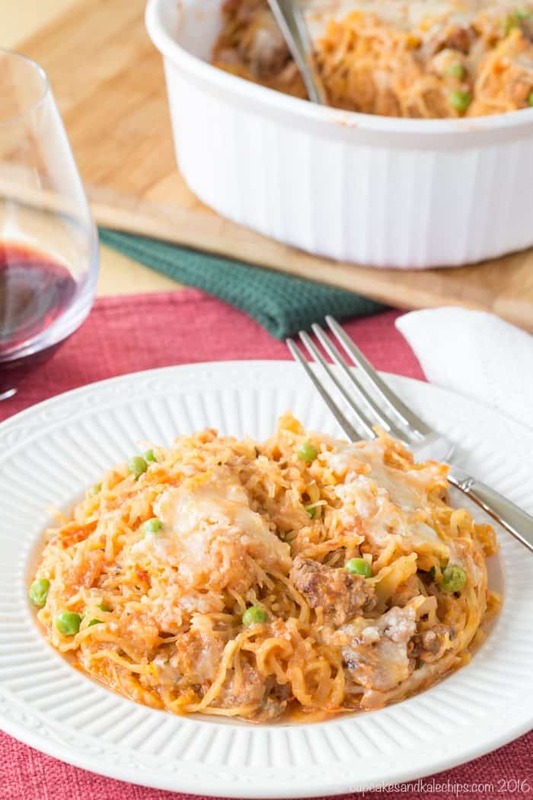 This spaghetti squash casserole is a healthy, gluten free, low carb comfort food that’s just as creamy, cheesy, and delicious as any pasta casserole recipe. It’s hearty and satisfying with just a bit of heat from a few links of spicy sausage to add the perfect amount of kick. I hope you’ll leave a comment and give it a FIVE STAR rating or share a photo on this pin on Pinterest! 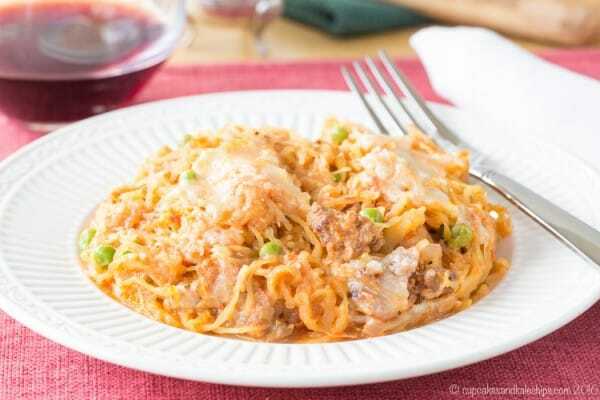 Cook the spaghetti squash in your desired manner (se post for tips) and scrape out the "noodles". Preheat or keep your oven set at 400ºF. Heat a pan over medium heat, and spray with olive oil or cooking spray. Squeeze the sausage out of the casings into the pan, and cook until is starts to get nice and brown. Add the onions and saute until translucent and soft. Add the wine, tomatoes, oregano, salt, and pepper, and simmer until it is hot and the onions are fully cooked. Stir in the heavy cream, parsley, ¼ cup parmesan cheese, and frozen peas. Pour enough sauce over the squash noodles (or pasta) until it is as saucy as you like (I like mine less saucy as my husband, so there may be some extra sauce, which you can serve on the side). Pour the mixture into a glass baking pan or casserole dish (I use the 1½ qt. oval Corningware) that has been sprayed with olive oil or cooking spray. Sprinkle the mozzarella cheese evenly across the top of the casserole. Bake for about 10-15 minutes, or until hot and bubbly, and the cheese is golden brown. Originally published on March 10, 2012. Photos updated on March 28, 2016. I made the Baked Spaghetti Squash Recipe with Spicy Sausage Tomato Cream Sauce. Your recipe is perfect, except I poured in most of the sauce. It was our first spaghetti squash recipe and we loved it! Thanks much! Is the mozzarella cheese supposed to be cooked in the sauce or on top? I didn’t see that in your directions. I’m so sorry for the delay in our response. 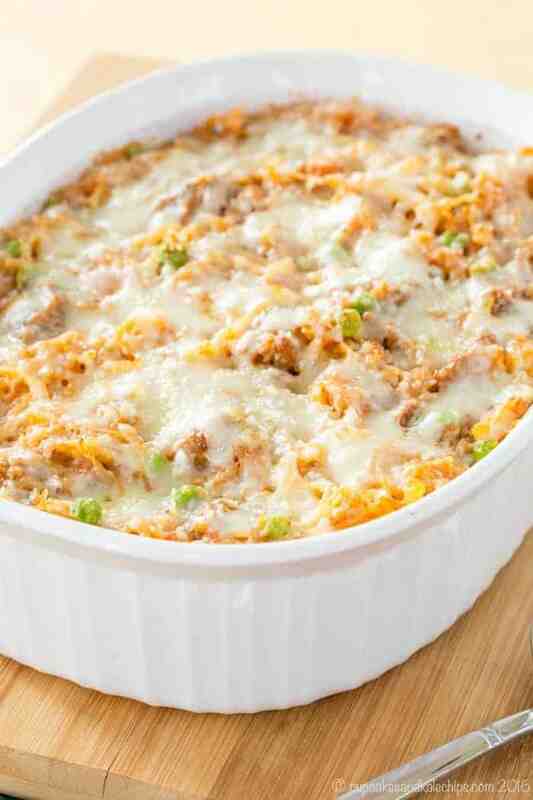 The mozzarella cheese is placed on top of the casserole before it gets baked in the oven. This recipe looks enticing and delicious. 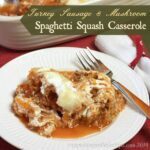 In September, I will be publishing a recipe round up featuring baked spaghetti, and I was wondering if I can include your baked spaghetti squash recipe in my round up and use one of your pictures. I will link back to your site for the recipe. Thanks for your consideration. Hi my friend, love all your recipes, I just noticed the way you made this sauce, you put onions after cooking the meat, that’s how I make my pasta sauce, I put lots of onions and 2 cloves of garlic. It seems like if you brown the onions slightly to bring out the sugar in the onion, it will sweeten the sauce naturally, and give a nice flavor. I learned that from a woman who was from Italy and my dad who ‘s a baker and can cook like a little ole Italian lady. If you like onions that is, but I think onions or garlic should go in the sauce after the meats are cooked, just like you did here, but I notice you didn’t do that for your lasagna sauce. I’m sure with all those flavors it wasn’t even noticed, but I was just curious. I ‘m gonna try this recipe, it’s almost like a vodka sauce, without the vodka, just the cream, plus I love peas. Sounds yummy, can’t wait to try, my son has been on this low carb. way to eat, so this will work out great. Oh yeah, just wanna say, I use the Barilla, no cook noodles too, their so much thinner and taste like fresh noodles. I even put a small amount of cream cheese in my cheese mixture a few times, I love spinach mixed in too. Thanks. Keep on cooking! Love this recipe, Brianne. Such a delicious option to spaghetti, with the added bonus of being gluten free for those who need it! Thanks Ann! I love spaghetti squash, almost more than the gluten-free pastas. 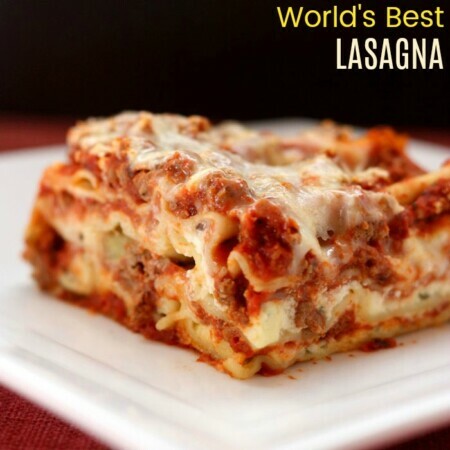 Oh, this looks fantastic – that sauce look so tasty and a great choice to put it over spaghetti sauce! Thanks! I have only just started trying the gluten-free pasta, so I was just making spaghetti squash for awhile. Great way to get in some extra veggies. But I am sure the sauce would be good over any type of pasta. I am going to try this tonight. Will let you know how it turns out. About how many people do you think it will feed? So glad you are giving it a try. It depends on the size of the spaghetti squash you get, but I would say it would feed 4. I made it tonight and got rave reviews! It was delish! I used peas and all the sauce. Also, i added more mozzarella cheese. So happy you liked it!! Yes, that is the great thing about cooking. I love to bake, but you do have to be pretty exact. With cooking, you can add more or less of things to your taste. 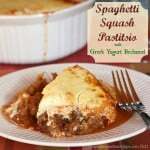 OMG I do not like spaghetti squash, but I think I could get DOWN with this recipe! I’m so going to give it a try. Thanks so much for stopping by my facebook page! The sauce is really good. 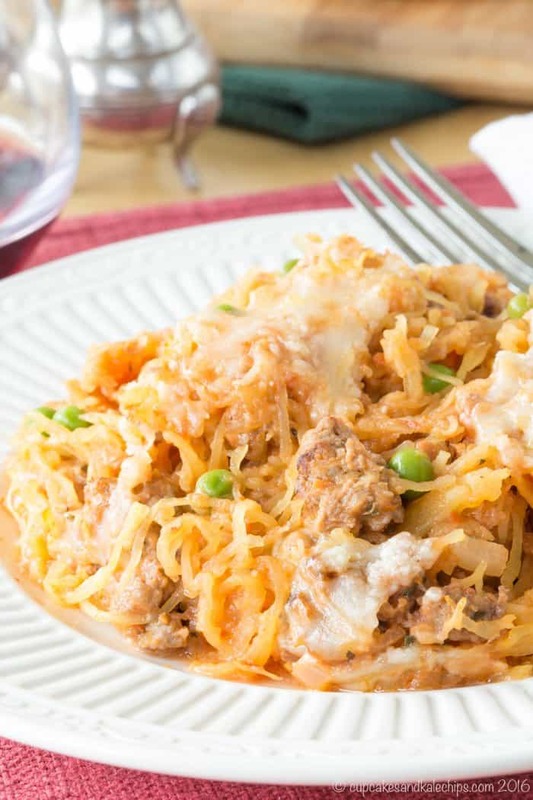 Give the spaghetti squash a try, but if not, I am sure it would be great on regular pasta. I am going to try this tomorrow night! Think I am going to use chicken sausage! SO YUMMY looking! Thanks! I hope you like it! Let me know how it goes.